Oh hai, fellow humans! I've been a creative little bean again and I'm here to show you the fruits of my creative loins. Loins is a bit of a horrible word, isn't it really?! I'm certainly no artist but I am a creative human with vision, tangible ideas and free reign of a watercolour set. I know, that's far too much responsibility for someone like me. Grab yourself a notepad, a pen and get ready to wre-. No. Nope. I can't pull that off. That's totally uncool. 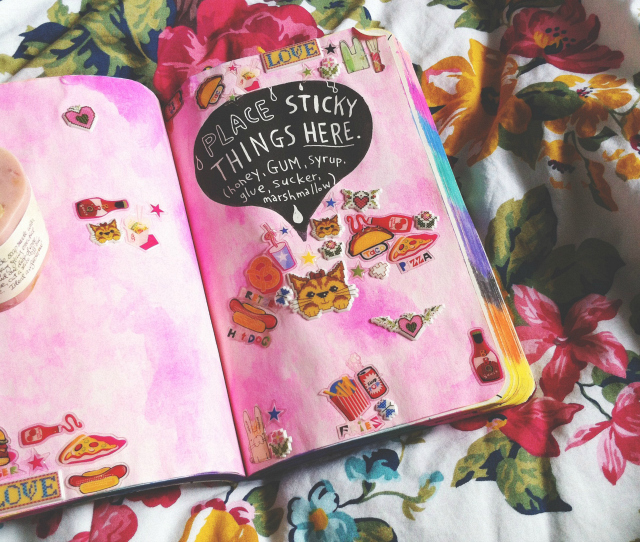 This is my messy test page for all of the pens, pencils, paints and such that I use whilst wrecking my journal! My inspiration for this page came from coach seats, bowling alley carpets, sugar paper, cartoons and childhood paintings. As you can clearly see, right?! Right?! I've totally got this art thing down, I know! This page is, quite clearly, unfinished but it'll get there slowly but surely. 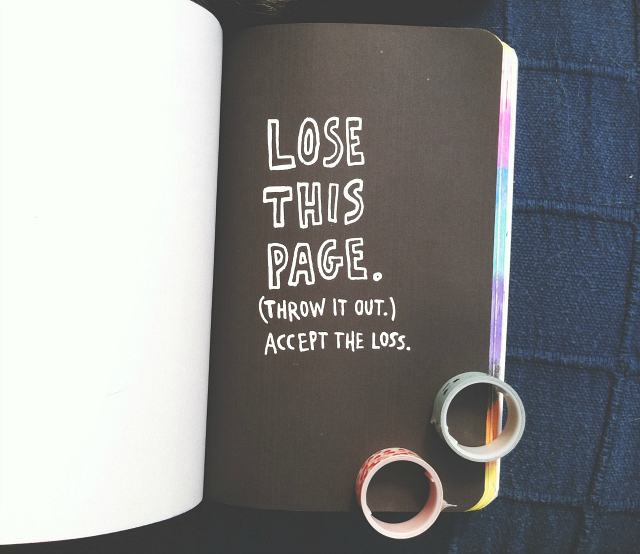 I absolutely hate losing things. It stresses me out beyond belief, which is really unfortunate because I seem to misplace my phone about ten times a week...However, on this occasion, I was totally okay with losing something because it bloody asked me to lose it, the fool! 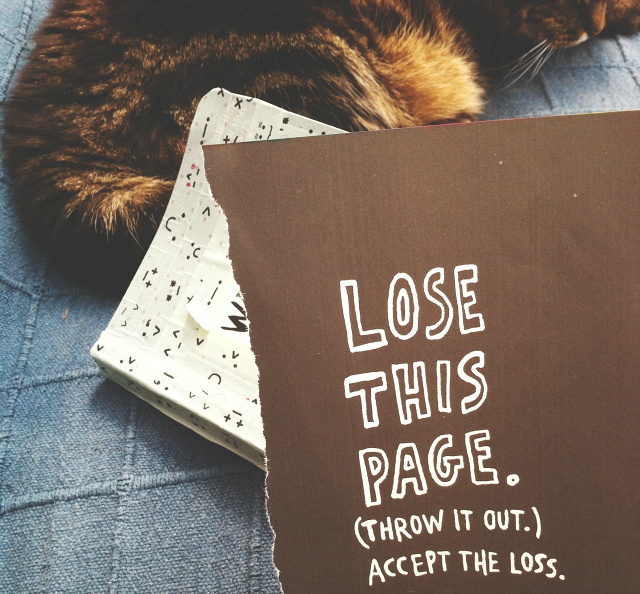 I ripped the page out and threw it on the floor before vacating the room. I have no idea where it went but I've accepted it and moved on. Hurrah for me. 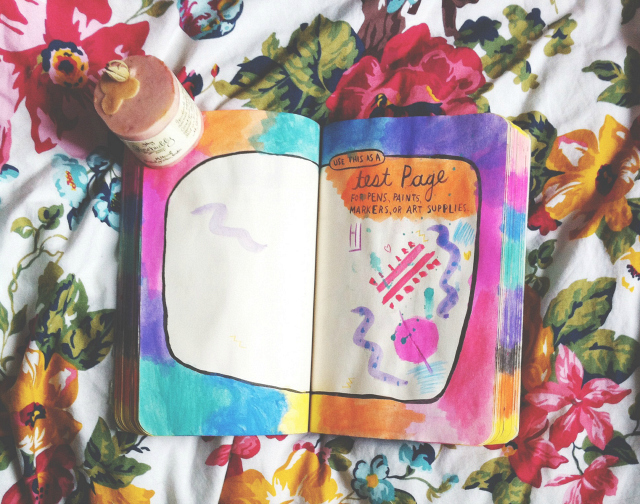 This journal is like therapy, completely free and readily available therapy. first photo, wet paint. second photo, dry paint. FIRST & second PHOTO, WET PAINT. third PHOTO, DRY PAINT. 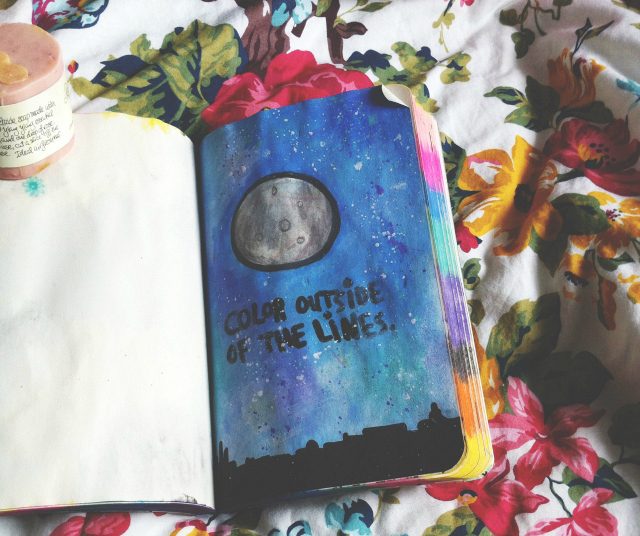 I don't like rules so I coloured inside, as well as outside, the lines. Anarchy is alive and well, people. I need to work on the mess that is my unfinished moon and re-do the shading before I'm happy with it but that'll be easy enough to do. I'm thinking of stretching this piece out across the two pages but that's subject to change as I may be cutting that page out. Oh, decisions. Big life decisions. God, I'm so edgy. 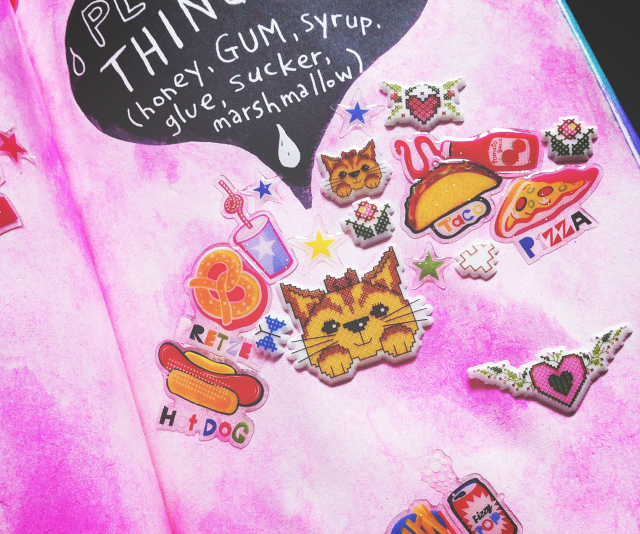 I thought I'd cover the whole page in stickers because they are, wait for it, sticky. Woah, woah, woah, sweet child o' mine! Don't stop me now! I also tried to go for a sort of marshmallow-y sticky background to go with it but I don't think that's very obvious...sigh...I only had cat and fast food stickers to hand, hello personal brand, but I'm going to buy some different ones and fill the entire two pages. 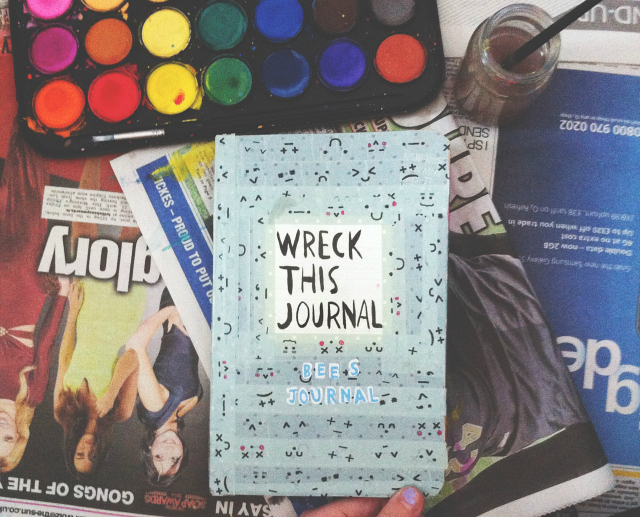 p.s Check out Wreck This Journal #1 and Wreck This Journal #2. *This post contains affiliate links. 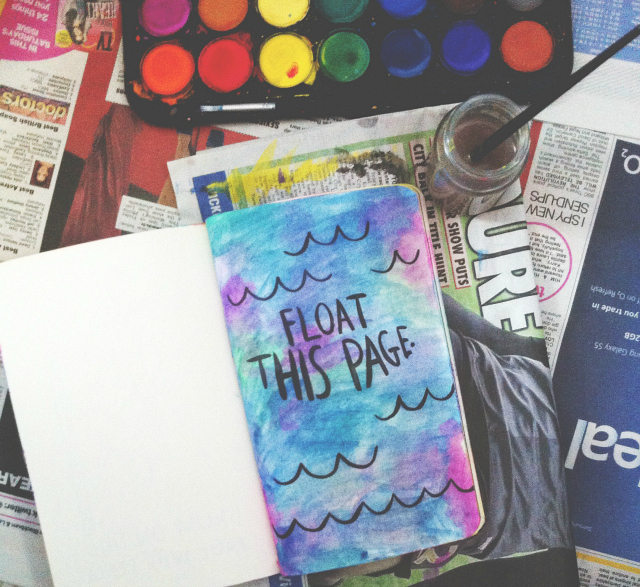 Basically, if you buy a Wreck This Journal through the links I've so lovingly provided, I will get a teeny tiny commission to put towards books in the far off future. Neat, eh?! Love this - so creative! I have the same problem! 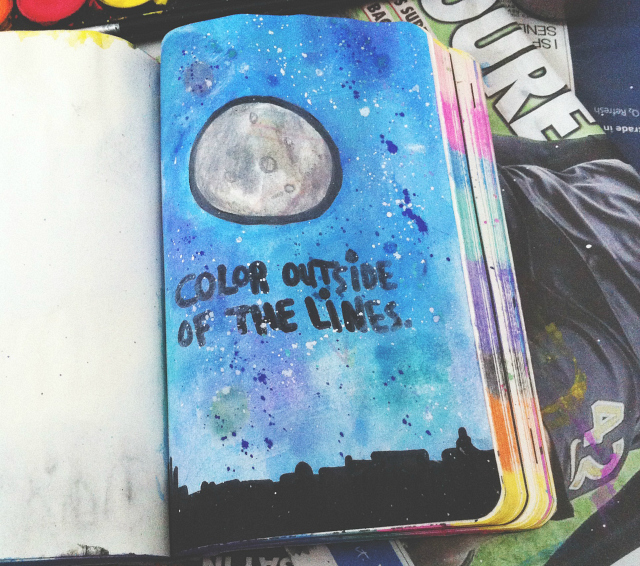 I think about trying one, but get caught up in how unartistic I am and decide against it! 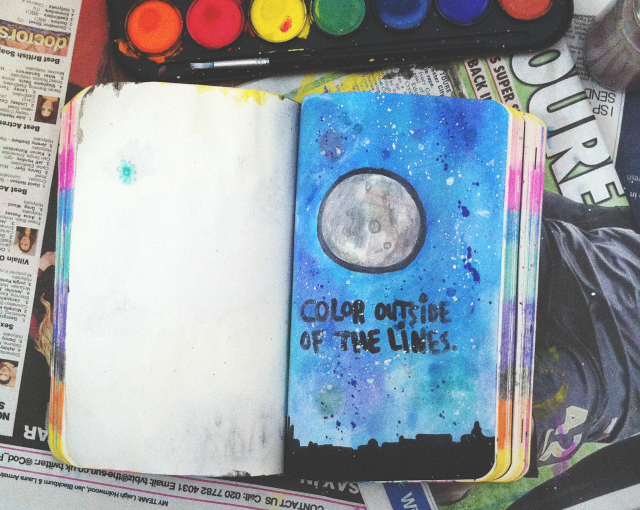 I LOVE the sky in your moon painting, the colours are so perfect Bee. I'm still really enjoying following along with you on this, so fun seeing what you do! 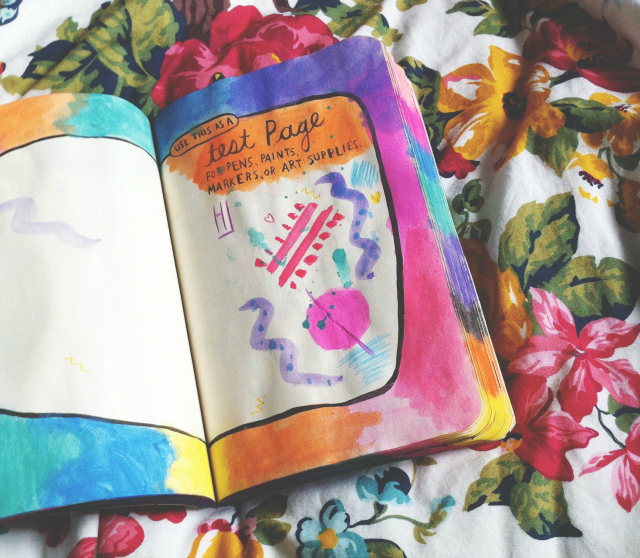 I love this, really like these journals but I don't think I'm creative enough for them! Losing things has the same effect on me, it's a nightmare, so I'm definitely considering investing in some of this free therapy now! 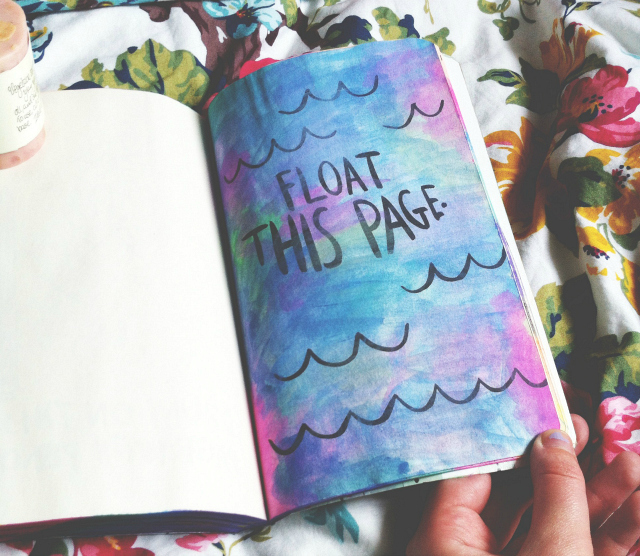 The colours you used on 'Float This Page' are lovely too. I'm looking forward to seeing the page in all of its crinkly glory! I have one, but it is currently packed away in our things ready for the move, yours is very colourful! I love your WTJ posts, can't wait for more.